The French interior ministry said at least 75,000 people had turned out across France for the latest "gilets jaunes" (yellow vest) rallies - so called because the protesters donned the high-vis vest required to be carried in every vehicle by law. Responding to the day's events from the G20 summit in Buenos Aires, Mr Macron said the protests "had absolutely nothing to do with a peaceful demonstration of a legitimate unhappiness or discontent." He said those responsible did not want change, but instead intended to "wreak chaos". 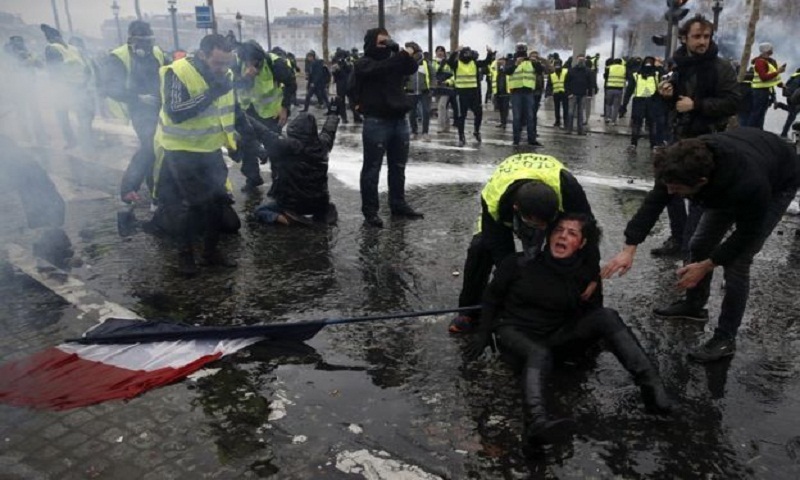 "No cause justifies that authorities are attacked, that businesses are plundered, that passers-by or journalists are threatened or that the Arc de Triomphe is defiled," he added. Dramatic protests took place over several hours in French capital. "It's a mess because we don't have a leader," Dan Lodi, 68, told AFP. Police fired tear gas, a water cannon and stun grenades to disperse those who were trying to tear down the barricades. Interior Minister Christophe Castaner, who visited the scene, tweeted that there were "1,500 agitators outside the security perimeter who came to fight". He called the protests "an insult to the republic". What else do we know about the protests? The movement has grown via social media to encompass rising anger at high taxes and living costs, and broader criticism of President Macron's economic policies. It has supporters across the political spectrum, from far left to far right, although Mr Macron has accused his political opponents of hijacking the movement in order to block his reform programme. Our correspondent says that because the movement has grown via social media, it does not have an identifiable leadership or a coherent demand. What it does have, he says, is a lot of co-ordination via Facebook and a lot of support from the public. Most demonstrators have remained peaceful, although more than 200 people were injured, several seriously. One person died when they were struck by a panicked driver and a motorcyclist was killed a few days later, when they were hit by a van making a sudden turn in the traffic chaos.